The 1980s was a decade of excess so you won’t be surprised to read that most of the car’s on this list offered masses of performance and style for incredibly high prices. This was a decade in which Ferrari brought us the Testarossa which no one can argue against being one of the best sports cars of the 80s. 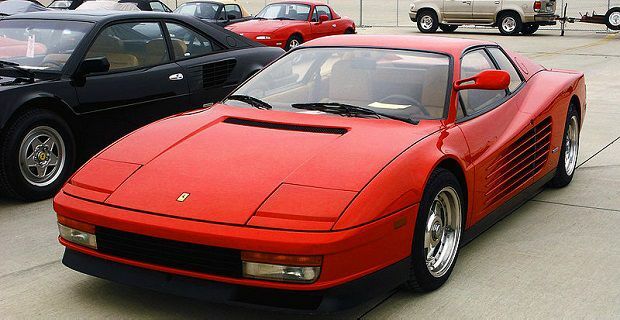 In 1984 Ferrari brought out a wedge-shaped super car that stylistically blew the competition away. The Pininfarina-designed car was a replacement for the Ferrari Berlinetta Boxer but everyone forgot the car that came before when they first took a look at the latest Ferrari. The 4.9 litre mid-mounted V-12 produced 390 horsepower and could accelerate to 100kph in 5.3 seconds. In 1988, Porsche unveiled their answer to the Testarossa – the Porsche 959. With styling that reminded us of the Porsche 911, the car had a familiar look that disregarded the more fashionable wedge-shape but this was as excessively 80’s as the Ferrari. With 510 ft-lb of Torque and 575 horsepower, this was a racing car for the road. We had to wait until 1987 to get a powerful Lotus Esprit because the early models were quick in the corners but slow on the straights thanks to 2 litre naturally-aspirated engines. Then turbo charged version had a 2.2 litre engine that produced 220 lb·ft of torque and 215 horsepower, both of which are way down on the Porsche and Ferrari, but the Giugiaro-styled Esprit looked the part and costs far less than its rivals. The early Lambo was a wedge-shaped car that looked purposeful. By the 1980s, a collection of wings, splitters and spoilers gave the car a racier feel. The Lamborghini Countach LP5000 QV, which was available between 1985 and 1988, had 455 horsepower and 465 ft-lb of torque so it was more than a match for other super cars of the era which is why it remains one of the best Lambos ever made.